Root perforation is an artificial communication between root canal system and the supporting tissues of teeth or the oral cavity. Various causes of root perforations include iatrogenic causes, root resorption, and caries.,, In endodontic practices, perforation may occur as a result of misaligned use of rotary burs during endodontic access preparation and search for root canal orifices. Bacterial infection enters either from the root canal or the periodontal tissues or from both. It prevents healing and brings about inflammatory sequelae, where exposure of the supporting tissues is inflicted. Thus, painful conditions and suppurations resulting in tender teeth, abscesses, and fistulae including bone resorptive processes may follow. Downgrowth of gingival epithelium to the perforation site can emerge, especially when accidental perforations occur in the crestal area by lateral perforations or perforations in furcation of multirooted teeth. ProRoot MTA (DENTSPLY, Tulsa Dental Specialties, Tulsa, OK) is one of the most commonly used brands, and it is used to form apical barriers in immature apices, root-end fillings, direct pulp cappings, pulpotomies, and in root perforation repairs. Biodentine is a dentine substitute, which was introduced in 2010 in an attempt to overcome the disadvantages of MTA. Biodentine has an initial setting time of 12min and is produced in a capsulated form. Both Biodentine and MTA are calcium silicate–based materials. In addition to the chemical composition based on the Ca3SiO5 and water chemistry, which brings high biocompatibility of already known endodontic repair cements such as MTA, with increased physicochemical properties such as short-setting time, high mechanical strength makes it clinically easy to handle and compatible not only with conventional endodontic procedures but also for restorative clinical cases of dentine replacement. This study therefore evaluated the effect of blood contamination on the push-out bond strength of four endodontic root repair materials such as MTA, Biodentine, glass ionomer cement (GIC), and Cavit. Fresh blood sample was collected at the Outpatient Department of Conservative Dentistry and Endodontics, Navodaya Dental College and Hospital, Raichur, Karnataka, India. By venipuncture, the whole blood was collected from a female donor. The donor participated voluntarily and provided oral consent, and freshly extracted 80 single-rooted caries-free human canines were selected for the study. Teeth with cracks and with any resorptive defects were excluded from the study. Freshly extracted 80 single-rooted human canine teeth were used. The crowns of all teeth were removed, and the mid-root dentin was sectioned horizontally into slices with a thickness of 1.0mm by using a diamond disk. In 40 samples, a 27-gauge syringe was used to inject blood into the perforated area, which was taken from the patient. Biodentine liquid, from a single-dose container emptied into a powder-containing capsule and mixed for 30s, was mixed in 10 samples, GIC (GC Fuji IX; GC, Tokyo, Japan) was mixed in 10 samples, ProRoot MTA, hand mixed with sterile water at a powder to liquid ratio of 3:1 in accordance with the manufacturer’s instructions, was mixed in 10 samples, and Cavit (ESPE Dental Products, US) was mixed in 10 samples and placed in the perforation area. In the remaining 40 samples, normal saline irrigation was performed before restoring 10 samples with Biodentine, 10 samples with GIC, 10 samples with ProRoot MTA, and 10 samples with Cavit. Push-out bond strength values were measured by using a universal testing machine (Instron universal test machine; Elista, Istanbul, Turkey). The samples were placed on a metal glass slab with a central hole to allow the free motion of the plunger. The compressive load was applied by exerting a download pressure on the surface of the test materials in each sample with Instron probe moving at a constant speed of 1mm/min. Push-out bond strength testing was carried out at the Indian Institute of Science, Bengaluru, Karnataka, India. The nature of bond failure was assessed under a stereomicroscope (SZTP; Olympus Optical, Tokyo, Japan) at 10× magnification. Each sample was categorized into one of the three failure modes; adhesive failure at test material and dentin interface; cohesive failure within test material, or mixed failure. In this study, data were analyzed by using one-way analysis of variance (ANOVA) and Tukey’s post hoc tests. P < 0.05 was considered as significant. [Graph 1] shows the mean values and standard deviations of the push-out bond strength (MPa) and the distribution of failures of all groups. The lowest push-out bond strength was observed in the MTA group (P < 0.05). Biodentine displayed a significantly higher resistance to displacement than the MTA group, whereas the mean push-out bond strength value was lower than that observed in the GIC and Cavit groups (P < 0.05). The mean values of push-out bond strength (MPa) for the subgroups of each test material are shown in [Graph 2]. Exposure to blood and saline solutions did not affect the resistance to displacement of the Biodentine, Cavit, and GIC groups (P > 0.05). However, the mean values of the push-out bond strength of the saline-treated MTA group were greater than the MTA control group (P < 0.05). A perforation, irrespective of location or etiology, hampers the prognosis of endodontic therapy. This mechanical/pathological communication between root canal system and external tooth surface should be sealed with a biocompatible material immediately. The perforation repair material could be subjected to tooth function as well as mechanical forces of condensation of restorative materials over the perforation repair site. MTA has been investigated in a series of tests and has shown many of the ideal properties. The histological response to furcation perforation repair with MTA in dogs showed cementum repair over the material and very little inflammation. When used as a root-end filling material in monkeys, the results showed no periradicular inflammation, a new bone formation, and a complete layer of cementum grown directly against the MTA. MTA is recommended as a root-end filling material in humans. Biodentine has been promoted as a dentin substitute, which can also be used as an endodontic repair material. It can also stimulate cell growth and induce hydroxyapatite formation on the surface of the material when exposed to the simulated body fluid. Saini et al., in 2008, compared the microleakage of three root-end filling materials: MTA, GIC, and silver GIC (miracle mix) using dye penetration technique under stereomicroscope. They found that MTA is a better material as root-end filling material to prevent microleakage, in comparison to GIC and Miracle Mix. The results of this study showed lower push-out bond strength of MTA when compared to Biodentine. This finding was similar to those obtained in previous studies. Furthermore, Biodentine push-out bond strength results were very similar to those of MTA. A previous study by Guneser et al. (2013) showed significantly higher retention in Biodentine than that in MTA. The specimens in their study were immersed in various endodontic irrigants for 30min before the placement in incubator. Comparing the push-out bond strength of Biodentine and GIC, GIC was found to be less resistant to dislodgement forces than Biodentine; no previous study compared the push-out bond strength between these two materials. In this study, the bond failure of all four materials was investigated. MTA showed a majority of mixed type of failure. The finding regarding White MTA is in agreement with Rahimi et al., but disagrees with this study that reported failure at the MTA–dentine interface. The differences might be attributed to the factors included in their study designs, different acidic or alkaline pH levels. The bond failure observed in Biodentine group was predominantly within the material itself (cohesive), which is in accordance with Guneser et al. This mode of failure may have occurred as a result of smaller sized particles that might modify the interlocking of Biodentine within the dentinal tubules. The results of this study demonstrated that Biodentine shows highly significant push-out bond strength to dentine compared to MTA, which was higher than that of GIC and Cavit. Within the limitations of this study, it can be concluded that push-out bond strength of Biodentine was higher than that of MTA, GIC, and Cavit on blood contamination. Nicholls E. Treatment of traumatic perforations of the pulp cavity. Oral Surg Oral Med Oral Pathol 1962;15:603-12. Eleftheriadis GI, Lambrianidis TP. Technical quality of root canal treatment and detection of iatrogenic errors in an undergraduate dental clinic. Int Endod J 2005;38:725-34. Fuss Z, Tsesis I, Lin S. Root resorption—Diagnosis, classification and treatment choices based on stimulation factors. Dent Traumatol 2003;19:175-82. Lantz B, Persson PA. Experimental root perforation in dogs’ teeth. A roentgen study. Odontol Revy 1965;16:238-57. Vanderweele RA, Schwartz SA, Beeson TJ. 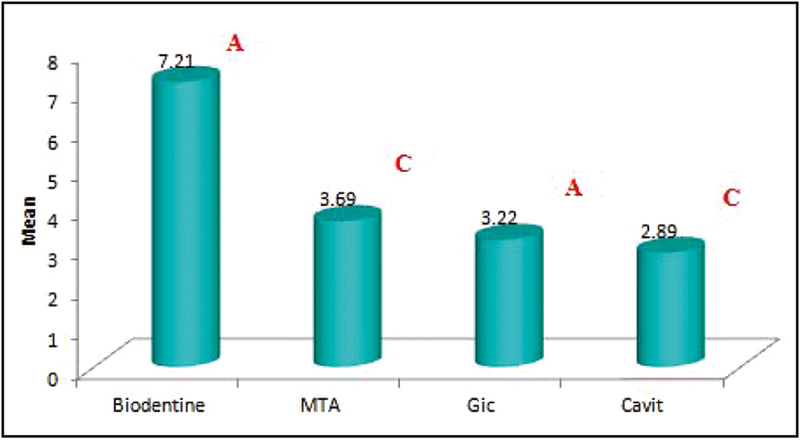 Effect of blood contamination on retention characteristics of MTA when mixed with different liquids. J Endod 2006;32:421-4. Shalan LA. The effect of blood contamination on compressive strength of two materials used in treatment of furcation perforation (A comparative study). Restor Dent 2012;24:25-8. Rahimi S, Ghasemi N, Shahi S, Lotfi M, Froughreyhani M, Milani AS, et al. Effect of blood contamination on the retention characteristics of two endodontic biomaterials in simulated furcation perforations. J Endod 2013;39:697-700. Tsatsas DV, Meliou HA, Kerezoudis NP. Sealing effectiveness of materials used in furcation perforation in vitro. Int Dent J 2005;55:133-41. Alhodiry W, Lyons MF, Chadwick RG. Effect of saliva and blood contamination on the bi-axial flexural strength and setting time of two calcium-silicate based cements: Portland cement and Biodentine. Eur J Prosthodont Rest Dent 2014;22:1-4. Kokate SR, Pawar AM. An in vitro comparative stereomicroscopic evaluation of marginal seal between MTA, glass ionomer cement and biodentine as root end filling materials using 1% methylene blue as tracer. Endodontology 2012;24:36-42. Alsubait SA, Hashem Q, AlHargan N, AlMohimeed K, Alkahtani A. 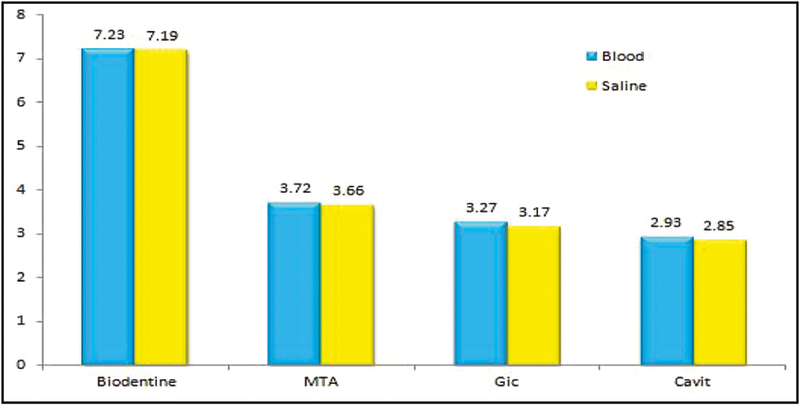 Comparative evaluation of push-out bond strength of ProRoot MTA, bioaggregate and Biodentine. J Contemp Dent Pract 2014;15:336-40. Parirokh M, Torabinejad M. Mineral trioxide aggregate: A Comprehensive Literature Review–Part I: Chemical, Physical, and Antibacterial Properties. J Endod 2010;36:16-27. Aggarwal V, Singla M, Miglani S, Kohli S. Comparative evaluation of push-out bond strength of ProRoot MTA, Biodentine, and MTA plus in furcation perforation repair. J Conserv Dent 2013;16:462-5. Ford TR, Torabinejad M, McKendry DJ, Hong CU, Kariyawasam SP. Use of mineral trioxide aggregate for repair of furcal perforations. Oral Surg Oral Med Oral Pathol Oral Radiol Endod 1995;79:756-63. Saini D, Nadig G, Saini R. A Comparative analysis of microleakage of three root end filling materials—An in vitro study. Arch Orofacial Sci 2008;3:43-7.